January | 2011 | Wiffle Lever To Full! Hello! It’s not too late to say ‘Happy New Year’, is it? I was desperate to get it in before the end of January. And no, that’s not a Richard Keys quote. Anyway, after a pitiful showing in 2010, I’m determined to put a bit more stuff on this blog during the twelve months of human existance that government scientists are already calling ‘2011’. I’ve made some extraordinary discoveries in the loft recently, so expect a few more ‘Nuggets…’ to come your way very soon, and my Uncle Trevor – recurring star of the now ancient historical document ‘Wiffle Lever To Full!’ – amazingly managed to repair an ailing hard drive containing thousands of my old radio interviews, so I’ll be transcribing some more Wiffle-friendly chats with a flurry of childhood TV heroes. In the meantime, I’ve been slowly adding to my collection of vintage Star Wars figures. 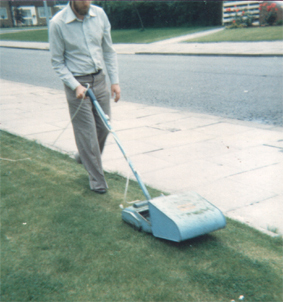 Dedicated followers of this rubbish will remember that, in 1986, I flogged my entire collection to a travelling toy collector who advertised her services in the classified section of the Middlesbrough Evening Gazette. She gave me fifteen pounds for the entire, planet-sized collection after my Mum sagely assured me that ‘no-one’s interested in Star Wars any more’. 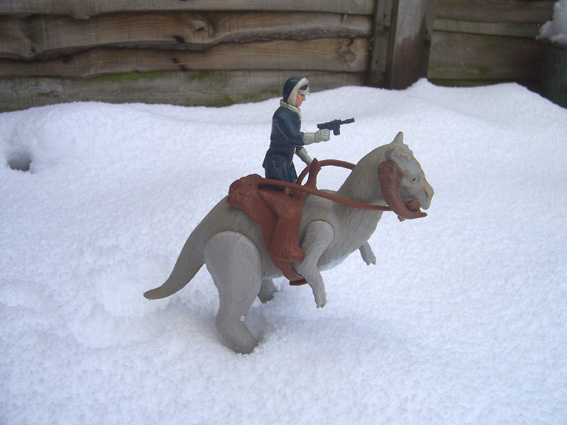 Amazingly, though, these are two hardy survivors of my original collection that somehow slipped through the net… Han Solo on his trusty Tauntaun, pictured riding bravely across the fearsome Ice Patio of Yarm during a recent cold snap. ‘Of course,’ he continues, ‘Artoo has been known to be wrong. From time to time’. As has my Mum, obviously. I forgive, but I never forget. More Suburban Star Wars pictures to follow.